cub reunites at Fresh at Twenty launch, Vancouver, Oct. 6, 2011 from Kaitlin Fontana on Vimeo. UPDATED: cub [not a] reunion show November 25th in Vancouver? OH ... MY ... GAWD. If I weren't living on the opposite coast and already going to see Wide Mouth Mason and Big Sugar on the same night, I'd totally be there. I'm hoping hoping hoping that this is somehow recorded in HD and decent audio. Long story short, Exclaim! reports a big Mint Records reunion show with a cub kinda-reunion starring Lisa Marr and friends. I suppose Neko Case could sub on drums, as she toured with them for a time. 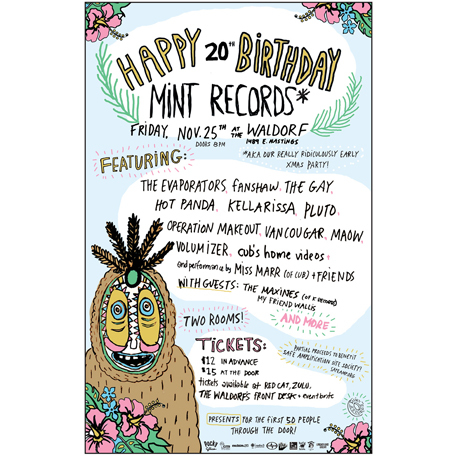 The performers so far are: Maow, Kellarissa, Hot Panda, Vancougar, Fanshaw, the Evaporators, Cub member Miss Marr & Friends, the Gay, Volumizer, Operation Makeout, Pluto, the Maxines and My Friend Wallis. Yes, you read that right: Neko Case's early garage rock project Maow are reuniting for the occasion, though at this point it's still up in the air as to whether Neko herself will make the trip to the show, according to organizers. Of course, this is hardly the only band reuniting for the party. The Gay, Operation Makeout and Pluto are all getting back together and playing their first shows in years. Also, Lisa Marr will be roping in some other members of her much-missed '90s cuddlecore outfit, as well as a few friends, to do a pseudo Cub reunion show. Again, we're unsure if Marr's friends include one-time Cub drummer Neko Case. It's all to happen at Vancouver's Waldorf Hotel on November 25. Tickets cost just $12 in advance ($15 at the door). Mucho thanks to reader Andy for sending this in. THIS IS NOT A CUB REUNION. i will not be there. please correct the information on the blog. don't perpetuate this falsehood. remind the fans that obviously there cannot be a cub reunion without me. understand how disappointing it is for me to see stuff like this. it is misleading to fans. from what i understand the performance is simply going to be lisa and some guests playing cub songs on her ukelele. My apologies go out to Robynn, and any fans, supporters or associates who may have been misled by what you see above. A source also tells me Neko Case will not be in attendance, so, in terms of a reunion-style performance involving former members of Cub, the best we can hope for is likely to be Lisa Marr with perhaps Lisa G on drums ... which you'll see in the next post.